I have a bone to pick with the normally impeccable Sub Rosa concerning their re-release of Broken Music. They describe these pieces as being “widely regarded as important sound art documents”, which suggests that they are of only historical interest, and risks obscuring the important fact that they sound freaking amazing. As a rule, I don’t buy records of only historical interest, because they end up just sitting slightly sadly on a shelf. But I’d have been sorry to miss this stuff because — and this bears repeating — it sounds freaking amazing. Fluxus-chappy Knížák started doing bad things to records as part of happenings in the 60s: he’d smash them up and glue bits of them together, stick paper over them, scratch them, paint them, and then play the results, often destroying the needle in the process. The results, judging by this 1979 release, were pretty astonishing. There are sub-second snatches of classical, rock, soundtracks, spoken word, jazz, and more, each just about recognizable for what it is but cut off before my ear can properly glom onto it. This constant teetering on the brink of coherence makes it wonderfully dynamic, and combined with the mostly propulsive rhythm of the thing, the overall effect is quite exhilarating. I won’t deny that it’s age is apparent, but it’s none the worse for being a bit lo-fi, and the aesthetic is timeless: the obvious descendents of this music are people like Christian Marclay, but I don’t think it’s too much of a stretch to draw a line from this to, say, breakcore. More importantly, though, this still sounds genuinely exciting. Having said all which… There’s no denying that it’s this modern release, of a 2014 concert, which is the one that really blows me away. 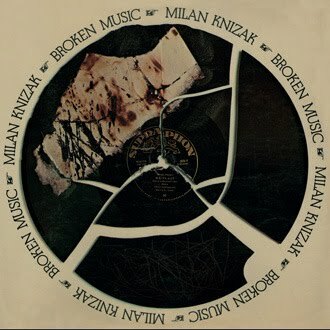 The first track, and my favourite thing here, is a 45-minute updating of the original Broken Music concept by Knížák and Phaerentz using broken vinyl, CDs, cassettes, and a keyboard. The advance of technology basically makes this a fuller realization of the concept: the palette is richer, the sound denser, and the recording fresher. If Broken was exhilarating, this is a pure adrenaline rush, bursting with tension and rhythm and drama. The second track is a 33-minute “contemporary reinterpretation” by the Opening Performance Orchestra for “5 laptops & fraction music”, and it’s just mind-blowing. This is turned up to 11 throughout, and the source material harder to discern under a thick layer of howling, clattering noise — although several of the first track’s samples are recognizable. More than anything else, this reminds me of an Aphex Twin gig from about 1999/2000… and, while I think it loses something in the translation to home-listening, anything that can make me feel like that must be doing something right. (Spoiler alert, though: they don’t drop Billy Jean or Take On Me.) The two tracks go really well together add up to a stonkingly good, powerful, exciting album. I bought both of these from the label.